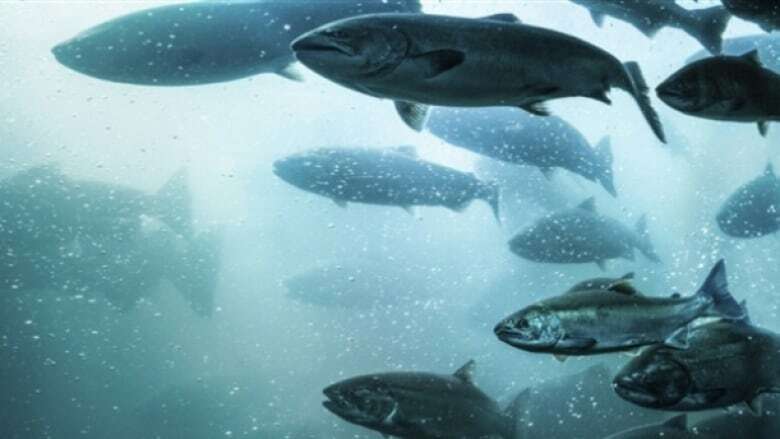 The Federal Court has struck down a Department of Fisheries and Oceans policy on farmed salmon, after finding that the ministry was ignoring testing for a virus when issuing licenses for the transfer or release of farmed salmon. The Federal Court has struck down a Department of Fisheries and Oceans policy on farmed salmon, after finding that the ministry was ignoring testing for a virus when issuing licences for the transfer or release of farmed salmon. Independent biologist and marine activist Alexandra Morton sued the ministry in September along with the 'Namgis First Nation, claiming that salmon being introduced to open pen facilities were not screened for piscine orthoreovirus (PRV), which can cause heart and muscle inflammation in infected fish. The judge agreed, ruling on Monday that the current practice is unlawful. "We're really happy. I think this is a critical victory for the health of wild salmon," said Kegan Pepper-Smith, a lawyer with Ecojustice, which represented Morton. "The minister must consider the science regarding the harm caused by PRV and the dire state of wild salmon." Ecojustice argued that farmed fish with the virus would infect wild salmon passing by the farms and further threaten declining salmon populations. According to fishery regulations, the ministry may issue a licence to transfer or release farmed fish if, among other things, "the fish do not have any disease or disease agent that may be harmful to the protection and conservation of fish." But the policy was not to test for PRV — a policy the DFO now has four months to change. "Our hope is that instead of fighting this further in court by appealing it, for example, the minister sees the writing on the wall that the era of reckless fish farm management is no longer acceptable and instead adopts a new policy that prioritizes precaution and health of wild salmon," said Pepper-Smith. B.C. farmed salmon gets 'good alternative' rating in U.S. In an emailed statement, Fisheries Minister Jonathan Wilkinson said the court's decision is being reviewed. "Our government understands that a strong, science-based approach to regulating the aquaculture industry is essential, and that is why we have and will continue to conduct extensive research which informs our policies and regulation," said Wilkinson. "We support a sustainable and responsible management of our stocks, informed by sound science."